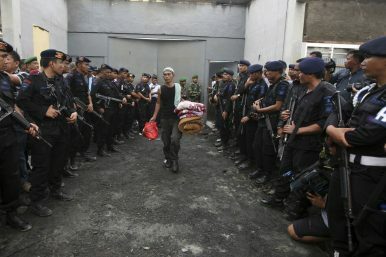 Armed Indonesian police officers watch an inmate carrying his belongings at Labuhan Ruku prison, which was burnt after a riot, in Batubara, North Sumatra, Indonesia (Aug. 19, 2013). A deadly prison riot underscores the risk of radicalization behind bars. Indonesia’s prison system has taken another hit. On May 8, Mako Brimob, a maximum security detention center in Depok on the outskirts of Jakarta was attacked by inmates. The siege lasted over 36 hours left five police officers and a prisoner dead. Details of exactly what happened are still sketchy. In a press release, the Islamic State (ISIS) claimed responsibility for the riot – a claim refuted by the police, who say the riot was a fight over food that got out of control. Unconfirmed photographs circulated on Indonesian social media showing supposed terrorist inmates flying the Black Standard (now widely known as the “ISIS flag”) and standing over bloodied victims. When police from Indonesia’s elite counterterrorism squad Densus 88 stormed the cells, four police officers had had their throats slit so deeply that they had almost been decapitated. One officer had been shot and killed and another, who survived, was held hostage and tortured for over a day. This incident, however unclear, has catapulted Indonesia’s prison system back into the headlines. But the siege at Mako Brimob is hardly a rare event. The same detention center saw a smaller riot in November 2017 and prisons all over the country regularly experience mass break outs, riots, and widespread violence against both guards and inmates. Just a quick look at the figures reveals part of the problem immediately. Indonesia has 464 prisons and detention facilities with a capacity to hold 124,006 prisoners. But, as of March 2018, the total prison population in Indonesia, including pre-trial detainees and prisoners on remand, stands at just over 240,000 – with an occupancy rate of 193 percent. In 2000, the total prison population was just over 53,000, showing a dramatic increase in the last two decades Without the funds and the infrastructure to manage Indonesia’s ballooning prison population, it’s no wonder that the system is overwhelmed and under attack. According to prison officials, some 70 percent of convicted inmates in Indonesia are drug offenders, as Indonesia has some of the toughest drug laws in the world. From January to March 2017, the national prison population increased by a staggering 12,000 inmates, meaning that cells meant for five prisoners now house up to 40 in some prisons. Not only is this inhumane, but packing large numbers of inmates together in one cell means that guards often struggle to contain prison populations and maintain order. In 2013, 200 inmates escaped from a prison in Medan, North Sumatra, and in 2017 over 400 prisoners fled from a prison in Pekanbaru in Riau Province. But it’s not just mass breakouts that are a problem in Indonesian prisons. The issue of overcrowding can lead to an even more sinister phenomenon: the radicalization of prisoners. Radicalism in Indonesia flourishes in prisons for several reasons. There’s nothing in place to break up radical groups because convicted inmates are usually held together and can start new terrorist cells which can’t be easily controlled by the security forces. As inmates are in close proximity, it’s easy for them to spread their radical ideology and recruit more members. This is an important issue. It’s well known that Indonesian prisons provide little in the way of material support for prisoners, with the rationale being that families should take care of inmates to avoid them being a burden on the Indonesian tax payer. As such, inmates have to rely on family members to bring food to supplement meager prison rations as well as provide basic sundries like toiletries. This means that not only do radical groups in prisons give inmates a sense of place and belonging, they also, crucially, often take care of them financially. Ghazali himself is a good example of how the prison system could work if it was properly organized. When he was arrested, Ghazali was placed in solitary confinement and interrogated for hours on end. He credits this experience with his decision to turn away from terrorism. “Once I was away from other terrorists espousing the same radical ideology, and when I was questioned about what I had done, I began to realize how flawed my thinking had been,” he says. By the time Ghazali was convicted, he was well known in the prison for being a “reformed” terrorist and kept in isolation for his own safety. This saved him from being re-radicalized. It’s a powerful example of how convicted terrorists, cut off from their peers, can reform and become role models in their community. To that end, Ghazali has now opened the Al-Hidayah Islamic Boarding School on the outskirts of Medan, which houses the children of convicted terrorists and teaches them not to follow in the footsteps of their parents. She, like Ghazali, explains the need for terrorist prisoners to be kept in isolation as much as possible so that they don’t get the chance to continue to spread radical ideology, either within the prison walls or outside. Jacob suggests some measures that would prevent this from happening. Following the bloody incident at Mako Brimob, the authorities chose to punish over 150 prisoners involved in the prison riot by sending them to Nusakambangan, a prison island in Central Java known as “Indonesia’s Alcatraz.” The cluster of prisons on Nusakambangan is known for having housed some of Indonesia’s most notorious inmates over the years, including Ali Gufron, Imam Samudra, and Amrozi – the masterminds behind the Bali bombings in 2002, which killed over 200 people. All three men were executed in 2008. It’s difficult to see how moving inmates from Mako Brimob to Nusakambangan will achieve much other than compounding the issue of terrorist inmates being held together – further perpetuating the cycle of radicalism. In the short term at least, there are no easy fixes. And until more money is pumped into the system to improve conditions and training, Indonesia’s prisons look set to remain broken for some time to come.